Travel by coach bus to take part in this one-day tour to experience strawberry picking in Yamanashi prefecture. You can enjoy the majestic view of the mountain from Mt Fuji 5th Station, located at the height of 2,305 meters, with temperatures 10-15 degrees lower than ground level. Take the time to savor a delicious lunch at the restaurant at Mt Fuji 5th Station before enjoying the incredible view of Mt Fuji from Lake Motosu and its moss pink fields. The day trip will begin bright and early at 7:20am departing Shinjuku. After meeting with your tour conductor, you will travel by coach to Yamanashi Prefecture. This area is known as the ‘Kingdom of Fruit’ for its high quality fruits, so you have come to the right place! There, you will pick strawberries and eat as much of the plump juicy fruit as you can for approx. 30 minutes. Afterwards, continue your trip to Mt Fuji 5th Station taking the Fuji Subaru Line. Not only will you enjoy the majestic view of Mt Fuji from its 5th Station and the sea of clouds, but you will also be able to see a grand view of the foothills of the mountain and Lake Kawaguchi below. Take a break to enjoy a vegetarian lunch at the Mt Fuji 5th Station restaurant, including the local specialty Hoto hot pot, mountain vegetable rice and tempura. Make sure you leave a little room for an after lunch stroll to digest your food! Once you have finished your lunch, jump back on the bus and head to Lake Motosu for the "Fuji Shibazakura Festival". Delight in the incredible view of Mt. 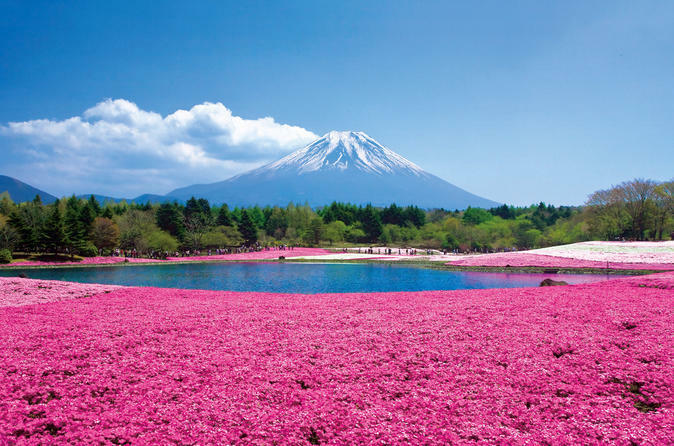 Fuji with the pink field of around 800,000 shibazakura flowers, or moss phlox in English. Enjoy the festival before heading back to Tokyo. The approximate arrival time in Shinjuku is between 17:30~18:00.